Proposed new tax breaks in the Finance Bill will fuel an existing commercial property bubble in Dublin. They’ll do this by making commercial property investment, mainly by large foreign landlords, entirely tax free. This will drive up commercial rents, suppress residential development, put Irish banks at risk, and deprive the State of much-needed funds. As far as I can tell, no other European country offers a tax-free environment on commercial property. And in light of our recent property bubble, fuelled by foreign capital, it’s difficult to understand why it’s being proposed. 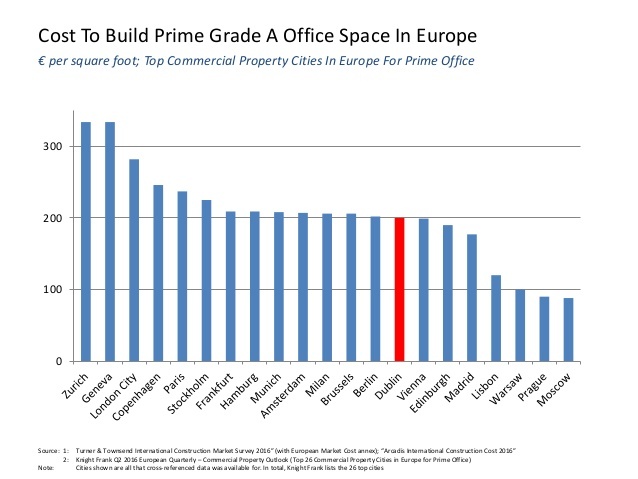 Particularly because we already have a bubble in commercial property in Dublin. 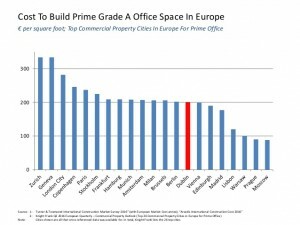 Surveys by CBRE and Knight Frank show Dublin to be the second most expensive city in the Eurozone to buy high-quality office property. This isn’t due to build costs – international surveyors provide comparative data showing Dublin build costs in line with other Eurozone countries. It isn’t due to demographic or geographic pressures – Dublin’s population density is low, and the city is surrounded by suitable development land. And yet, grade-A commercial property currently sells for 6.4 times more than it costs to build. In Europe, only Paris and London have higher multiples. And that, in anyone’s book, is a bubble. Well, almost anyone’s. Large real estate agents who sell commercial property are paid as a percentage of sales price. So high volumes of sales, at high prices, make them a lot of money. Some will insist there’s no bubble, that it makes perfect sense for this small city on the edge of Europe to have some of the highest prices on Earth. They’ll point to yields from commercial property as being very reasonable. Exactly the arguments we’ve heard before, from about 2004 to 2008. This bubble damages the economy. Commercial rents have been spiralling in the capital, nearly doubling in the past two years. That’s bad for business, and bad for consumers. Residential development is being suppressed. Right now, decent commercial property in Dublin is selling for more than €1,200 a sq ft, while residential property sells for about €500 a sq ft. So naturally, developers and owners of zoned land are highly incentivised to build offices, rather than homes. The bubble also puts the Irish banks at risk. There are numerous new safety valves in place since the Crash, but the last thing anyone wants is for our domestic banks to be lending into another property bubble. Part of what’s driving this bubble is a raft of recent tax breaks. Real Estate Investment Trusts (REITs) were introduced in the 2013 Finance Act. As one international fund puts it on their website, Irish REITS, “unlike other property companies, distribute their income in a highly tax-efficient manner”. Irish Collective Asset-Management Vehicles, ICAVs, were introduced in 2015. Qualified Investment Funds (QIF) are another legal vehicle used by property investors to ensure tax efficiency, allowing profits be rolled up for several years. And Section 110 status is used by many so-called vulture funds to lawfully pay minimal or no taxes in Ireland. What the lawyers and accountants have figured out is that if you combine various tax-efficient mechanisms (let’s say a QIF with a Section 110, or an ICAV with non-domiciled status), then property investors can move from being tax efficient to completely tax-free. The Finance Bill should be targeting this behaviour to ensure taxes are paid, rather than avoided. Up to now, commercial property in Ireland hasn’t generally been marketed to foreign landlords as tax free. Many people in the sector believe that, while tax-free status might be possible, it’s not what was intended. The Finance Bill creates a new legal classification known as an Irish Real Estate Fund, IREF. Once investors hold property for five years, they’ll be exempt from all capital gains taxes. It goes on to state that IREFs will, however, pay 20pc dividend withholding tax, DWT. However, it then exempts from this almost every domestic and foreign landlord who buys Irish commercial property. The era of the so-called vulture funds is coming to an end, as the ECB’s negative yields policy has made most EU real estate too expensive for them. According to CBRE, more than 80pc of all future Irish commercial property investment will come from foreign pension funds, life assurance funds and other Collective Investment Undertakings (CIUs) which includes REITs. All of these will be exempt from DWT. Irish pension funds are already exempt from taxes in Ireland. However, notwithstanding some exceptions, they don’t get exemptions from taxes when they invest in other countries. Generally, countries don’t give tax breaks to each other’s pension funds, and DWT cannot be reclaimed. It’s unclear then, why Ireland would now choose to give such tax breaks to foreign pension funds investing here. Similarly, Irish life assurance companies were never exempt from Irish taxes. They do make use of tax deferral mechanisms such as QIFs, but pay their taxes at exit from those schemes. But not for long. The Finance Bill makes genuine efforts to stop tax avoidance by the so-called vulture funds. This could bring in €10 to €20bn in new taxes to the State in the coming decade. Industry sources working with the vulture funds are confident they can still bypass these new measures, but some additional changes can make this much more difficult. However, it would be a great tragedy to win the battle and lose the war. As it stands, the Finance Bill will effectively take commercial property, one of our biggest asset classes (possibly our biggest), outside the tax net. There’s no obvious reason for doing this. Other countries don’t. We’re already experiencing a bubble. It’s making things worse for the business community and for people looking to buy homes. It would cost the State billions in coming years in foregone taxes.